The water flows in and around the sea caves that have been formed by the continuous movement of the sea in Dungeon Provincial Park, Cape Bonavista in Newfoundland, Canada. Many tourists come to view these sea caves while others have ventured into them in search of infamous samples of fools gold. Arches and sea caves in Dungeon Provincial Park, Cape Bonavista, Bonavista Peninsula, Discovery Trail, Bonavista Bay, Newfoundland, Newfoundland Labrador, Canada. 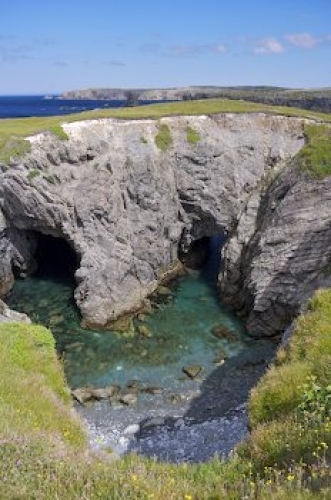 Picture of the entrances to the sea caves in Dungeon Provincial Park in Newfoundland.